Jonas Brothers revealed to Life Story what it takes to date one of them! 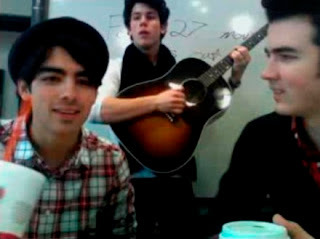 NICK: 'We are the type of guys who prefer that we ask a girl out instead of the other way around. We were raised to be gentlemen! All of us prefer to do the asking and we always pay on date. I notice a girl's smile, if she looks like a happy person or not. A beautiful smile can tell you what's in someone's heart. [Like Miley!] One I start getting to know someone, then I'll notice that I'm feeling relaxed and comfortable and then I really know I like that person. Jordin Sparks chatted to E! about going on tour with the Jonas Brothers in June. Are you excited? I am so stoked. What I've got confirmed so far are the U.S. tour dates, and it is a pretty long tour. I think it's close to 50 dates, and they keep adding more. I met them a couple years ago, and they are really great people. We've kept in contact and our paths have crossed. I am very excited to go on tour with them. It'll expose me to a whole bunch of other fans. Are you ready for the romance rumors to start? Because you know they are going to. That is so funny, because I have had so many people tell me that and I am like, 'Oh great, here we go.' It is really funny but I am ready.. Bring it on! Who do you think will win American Idol? You know, I actually really like Adam Lambert. But there is a lot of talent this year, so it's pretty hard. I haven't just voted for one person. I tend to vote for, like, seven people.